The Ohio DOT TAMP is available here. The Ohio DOT TAMP was published in July 2017. The plan is intended to satisfy the federal requirements, initiated by MAP-21, that all state DOTs to prepare a risk-based TAMP. 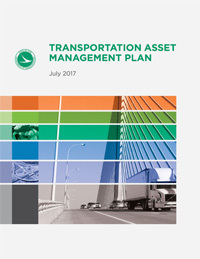 It is organized into six sections: Background; Preparing for the Future; Asset Management Approach; The Asset Management Process; ODOT's Performance-Based Investment Plan; Summary of Planned Activities and Enhancements. This document includes the following sections: Communications and Reporting, Current Methods and Tools, Financial Plan, Introduction, Inventory and Condition, Investment Strategies, Lifecycle Management, Objectives and Measures, Performance Assessment, Process Improvements, Risk Management.